Last week the Pirate and I were given a load of second-hand furniture by the parents of some friends of ours. They are moving and downsizing from a 5K square foot house to a 2.2K square foot mansion flat. So, naturally, some furniture had to go. For the £130 we spent on van rental we made out like bandits. We are now the proud owners of a 7 foot-long sofa, 2 chests of drawers and matching beside tables from Habitat and accompanying mirror, 4 teak folding patio chairs, and two solid wood bedside tables. It's these latter bedside tables which are of interest. They were in the shed in the garden (the shed in this case being larger than our dining room) and we were told, "Oh you don't want those; they're awful and full of mold and woodworm. We're going to burn them." They were painted white and while plain and in need of some TLC, were discovered to be rather sturdily built. "Oh please let us have them!" we begged. Since they were marked for the woodpile we were told we welcome to them, but it was implied we were more than a little silly for wanting them. We got them home and went to work on them. It's amazing what you can do with a can of Nitromors, a pair of neoprene gloves, and a week of Olympic TV coverage. I should have the last bits of the decorative molding I'm adding on this afternoon, and then i'll put the pics up. I think you'll agree: I've got a new carreer cut out as a stripper. I'm extremely excited about this. I began this with the view that it would just be a little cottage industry, something to help me earn a little pin money. But looking at the way the website is shaping up (I'm making it in MS Publisher), it looks ruddy professional. Now I'm thinking, the sky's the limit. Who knows how far this could go? How far do I want to take it? I don't even know, but I'm open to much bigger possibilities that I was a few months ago. I've also just realized that in telling y'all the name of the business you'll be able to go to my website and find the real me. Now all you cyber-crazies can find me in meat-space. Oops. Oh well. I'll have to take my chances. It never occured to me when I began discussing this with you that I was crossing over my real and virtual personalities. Now you know. Too late. 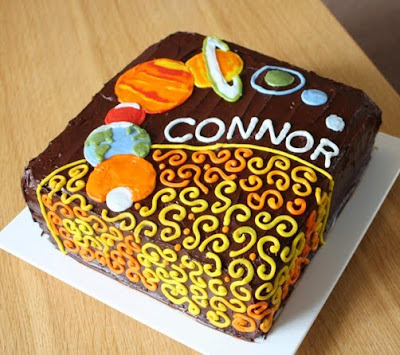 First up is a double-chocolate, 10-inch square layer cake with chocolate buttercream frosting, decorated in a solar-system theme with hand-piped buttercream. 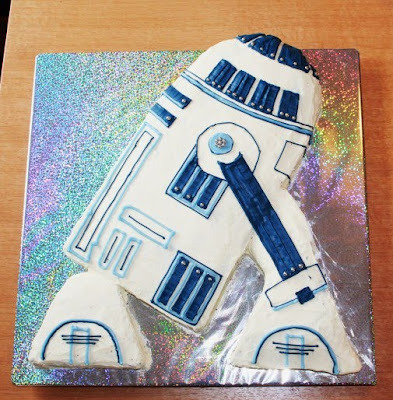 Next is this awesome R2-D2 cake. Fully 18" across, the sponge is chocolate, covered with white buttercram frosting and decorated with hand-piped buttercream and silver sugar balls (which you can't really see in the photo but looked great in person). 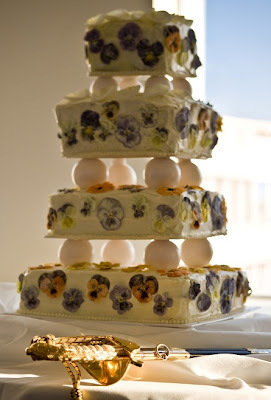 Lastly is my own wedding cake. Two tiers of lemon drizzle layer cake, 2 tiers of carrot layer cake, all covered with cream cheese frosting and decorated with real pansies and rose petals which had been crystallized by hand by yours truly, and all of which were completely edible.